We flew from Baltimore to London a couple of days after the Sprinter shipped. The van went to New York City and is now crossing the Atlantic. Tomorrow the ship stops in Germany, then on to Zeebrugge. We meet up again on the 29th of April, a few days later then originally scheduled. We both miss the convenience of having our on vehicle, but we are enjoying ourselves. 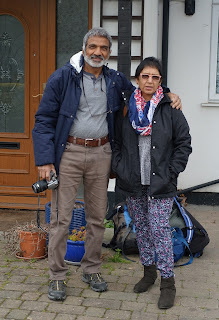 We stayed in the London area with our friends Chad and Champa. We met them through the Silk Route Network. They like to travel the world in their Sprinter also. Next month they leave to tour South America in their Sprinter. We had a wonderful time visiting with them. After a couple of days in London, we headed to Brugge on the Eurostar. The train is fast. You hardly realize you went under the channel. The train took us from London to Brussels. From there we caught a train to Brugge. The transportation system in Europe is great. Trains go everywhere and are frequent. Brugge is a beautiful city. It has canals and bridges everywhere. We have enjoyed walking around the past two days. It has been very cold, with several passing hail showers yesterday. Today the weather is forecasted for heavy showers. We think we will visit a couple of museums. There are sidewalk cafes everywhere. It must be really nice to eat outside on a warm day. You would absolutely freeze to death now. We need to ride this ferris wheel. If the weather clears the views should be fabulous. Window for a kitchen store. They have fun stuff for the kitchen. Of course there are chocolate shops everywhere. It is totally amazing what they do with chocolate. These chocolates are for you Don. A new set of tools. I am not sure how useful they are, but they sure would taste good. Strolling the city of Brugge.